A U.S. senator is holding a press conference announcing his intent to divert tax payers money away from space observation. The press listen intently allowing The Question to slip inside and neutralize the senator. The press are shocked until the rest of the JLU arrive and reveal the senator to be a disguised alien species called the Durlan. While the League apprehend the alien creature The Question mentally re-examines his theories and realizes from his notes that there are seven more Durlans in positions of power. The JLU congratulate Vic on discovering the Durlan plot and insist he ought to rest. Despite this later at night The Question cracks the JLU teleporter codes and materializes inside the senator's office. Searching through some hidden classified papers Vic is led to a Puerto Rican police station where the captured Durlan corpse lays inside a glass case. More still is the discovery of Dept. Omega, a secret CIA division. Inside the vaults of the Department, Vic discovers all manner of experiments and genetic manipulation and a link to another site in Tibet. Hastily but reluctantly Vic continues his investigation. Superman and Batman radio in that they've been able to capture five of the seven Durlans in hiding, with two left, the world's finest ask if he's enjoying his rest. The Question doesn't answer. As he discovers a link to Ley Lines he's attacked by Yeti hybrid clones. Having no powers to take on such beasts Vic teleports to a Ley Line crossing and discovers a Space-God. A slimy octobeast aroused from hibernation by Dept. Omega's plot. Vic follows more research that spans worldwide, from London, England through to the Batcave, Africa to West Virginia. He meets the mythical Mothman who in turn leads him to Hiroshima and back to the Watchtower. Despite the strange coincidence of it all, fuelling Vic's paranoia he continues on until the next morning. He interrupts a conference by J'onn to tell the entire League he has found something strange. Flash reveals that while they were hunting for Durlans they had set up Vic with a trail of illusions and props to keep his paranoid behaviour out of the way while they completed their mission. "No hard feelings? ", asks Superman. With that The Question reveals he knew he was being distracted by a fake mission. He reveals that they were clumsy enough to leave behind DNA and other evidence that had revealed it as such. Just because he's paranoid doesn't mean he's stupid. With that he electrocutes Superman in front of the entire JLU. Huntress and The Question watch as the real JLU and human Senator arrive capturing the Durlan. Question reveals it was all obvious - in hindsight. 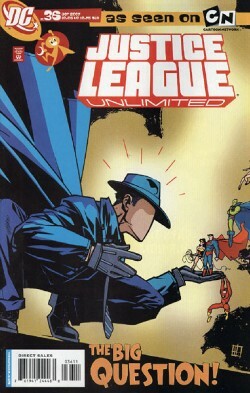 Story - 5: This is one of the all time best ever issues of JLU so far. The Question was on top form and the book was an absolute joy to read. The inclusion of the Durlans as an undercover species and the fact that Dept. Omega might or might not actually be real... More please! Art - 3: Min S. Ku continues to deliver fresh new artwork building further upon the art from the show while not alienating their design style while creating the Durlans. Cover Art - 3: Great cover reveals that the issue is a Question-centric issue and that its based totally on fun. It's not however about Vic discovering the incredible shrinking JLU!